Eternal Orthodox Church calendar for the 10.08 year 2017. All four were of the number of the seven deacons and the seventy apostles. 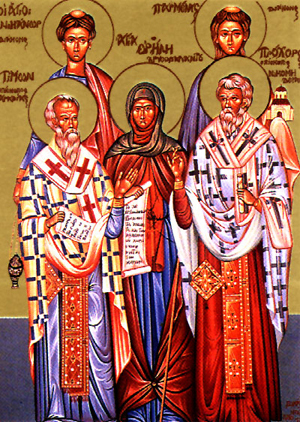 The other three deacons were Stephen, Philip and Nicolas. Stephen, the first martyr, is commemorated on December 27th, and Philip on October 11th. Nicolas was not included in the ranks of the saints because of heresy. These first four have no separate commemoration, and are commemorated together on this day. 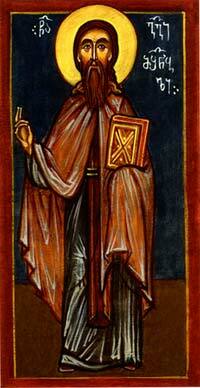 Prochorus was consecrated by the Apostle Peter as Bishop of Nicomedia. He served for a time with St John the Evangelist and, on the island of Patmos, wrote down the Revelation that he heard from St John"s lips. After that, he returned to Nicomedia, where he made great efforts to bring the people to the Faith. 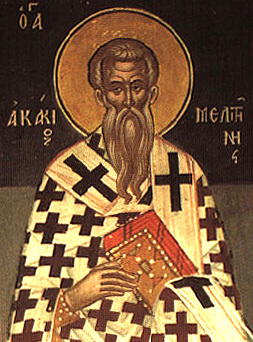 He died a martyr in Antioch, where he was murdered by unbelievers. Holy Nicanor suffered in Jerusalem on the same day as St Stephen the Archdeacon, quickly followed by two hundred others, killed by the wicked Jews. Timon was bishop in Arabia, and was crucified for Christ. Parmenas died before the eyes of the apostles, and was mourned and buried by them. 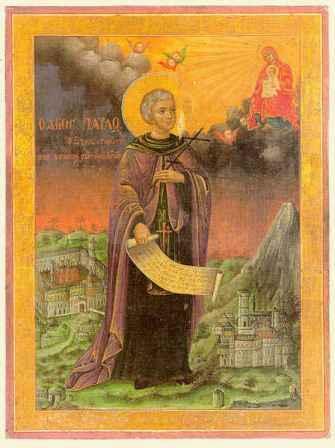 In the time of the Emperor Antoninus (138-161), St Julian went from Dalmatia to Campania in Italy. He was a handsome young man, utterly consecrated to God in his soul. On the way, he met a group of imperial soldiers, who were on their way to round up Christians. "Peace be to you, my brethren! ", said Julian to them. By such a greeting and by the meekness of the young man"s face, the soldiers deduced that he was a Christian. To their query, Julian replied: "I am a Christian, born in Dalmatia." He openly admitted to them that he was travelling with the aim of turning idol-worshippers to the one, living God. The soldiers beat him mercilessly and then cast him into a pit, where he spent seven days with no earthly food. An angel of God appeared to him, nourishing him with heavenly food. Brought to trial, Julian remained firm as diamond in the Faith. Seeing his courage and steadfastness in the Faith, thirty men turned to Christ the Lord. Condemned to death, St Julian knelt and raised his prayer to God, thanking Him for the gift of martyrdom and praying Him to have mercy on all who would keep his memory. He was beheaded with an axe, and gave his soul to God. The son of the Emperor Michael Cyropalates, he was endowed with profound learning and a rare wisdom, conjoined with meekness. Procopius, as he was called at first, was, in his early years, a marvel to the whole of Constantinople. The Emperor Romanus the Elder called him "the greatest of the philosophers". But, fearful lest his soul be made proud and fall through the praise of men, this glorious youth clad himself in the garb of a poor man and went off to the Holy Mountain, where he received the monastic habit from the famous hierarch Cosmas. After a long period of solitary asceticism, he re-founded the monastery of Xeropotamou and, shortly after that, built the new monastery of St Paul, where he died in old age. When this monastery was consecrated, Emperor Romanus sent as a gift a large piece of the Precious Cross, which is kept there to this day. 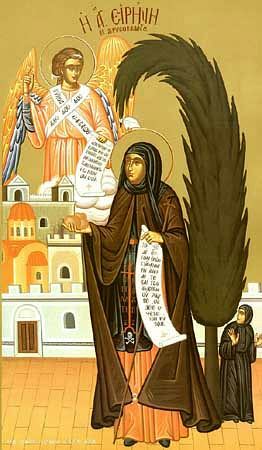 It is said of this saint that he preached the Gospel in Macedonia and Serbia. He endured much torment from the wicked Emperor Leo the Armenian, the iconoclast, and entered into rest in 820. At the time of his death, St Paul said to the brethren: "Lo, the hour has come that my soul has always desired, and which my body has always dreaded." This martyr of Christ was a soldier in Ancyra. Taken for trial, he feared no torture but freely glorified the name of the Lord Christ. The commander, Cornelius, ordered that his feet be drilled through and threaded with rope. After doing this, they dragged the man of God to a river and threw him in. Saved by the power of God and healed of his wounds, he showed himself alive and well to the commander. When the commander saw him alive, he was so filled with fear that he drew his sword and killed himself. Eustathius lived some time longer, and entered into rest in the Lord in 316.